Count On Me at Winton Carnival! Transition Bournemouth were out in force this weekend counting the carbon emission savings from Bournemouth residents. We took part in the Winton Carnival Parade with our live human counter and talked to the spectators along the route. We invited them to choose one or more sustainable activities like riding a bike, taking public transport, or growing their own fruit and vegetables. Each activity had a numerical value attached to it representing the amount of CO2 equivalent they could be saving over a year. People signed up with us on the day telling us about what they do that counts, and they also signed up via Facebook, Twitter and the Count On Me website. The total count for the day was a saving of 36,890kgs CO2; this would be like filling the Bournemouth balloon four times over. Amongst those who signed up were people who holiday at home in the UK, those who don’t have a car, and vegans and veggies who don’t eat meat, each doing their bit and being counted. It was a fantastic day and the response from the public was extremely positive, that together we could make a difference and have an impact on climate change, and begin to adjust our lives to become less reliant on fossil fuels. Transition member Angela Fendley designed the Count On Me campaign whilst studying at the Arts University Bournemouth. She became involved with the Transition movement locally after becoming aware of their activities during research for a second year project, which took her to the Slades Farm Community garden for a wildlife survey. This research informed her work ‘Natural Colours’ which provides a contemporary look at the colours of the wildlife in the local area. Angela became increasingly interested in the activities of Transition in Bournemouth and how they go about reducing the impact of climate change. So for her third year project she set herself the brief to design a communications campaign for the general public on how to live more sustainably and how to reduce one’s own personal carbon CO2 emissions. The aim was to not scare people about the enormity of the problem, but to provide simple activities that they could achieve. The Count On Me collective counter makes it measurable so they can see that their actions do have a positive impact. With support of the Transition Bournemouth members and in collaboration with the BH Green Group Count On Me was launched as a community campaign for the Winton Carnival. We will keep adding to the counter and you can come and talk to us about it at the Slades Farm Festival on Saturday 10th July. This will be a great opportunity to have a look around the Slades Farm Community Garden. This successful Transition project has been going since 2012 and runs regular conservation sessions open to all. Don’t forget to visit the Count On Me website www.countonme.today to sign up and be counted. Any activity where you reduce your carbon emissions is helpful. Please tell us about it #CountOnMe to be counted! Lets hope 2016 is just as good! BH Green Drinks Festive Feast 2015! Come and join us for some festive food and fun with friendly like-minded people. This event is open to anyone interested in anything green! We have booked several tables at Zoukinis Vegetarian & Vegan Restaurant in Westbourne for Thursday 10th December from 7:30pm. Downlond the Zoukinis Christmas Menu 2015 then e-mail! BHGreenDrinks@gmail.com to book your place! The Transition to a Green Economy – How can we achieve it in practice? The transition to a green or sustainable economy represents one of the most important challenges to society. Approaches to economic development are needed that avoid damage to the environment, while also improving human wellbeing and social justice. Some of the most exciting ways to achieve this transition have emerged from grass-roots initiatives such as transition towns. This event will explore how the transition to a green economy can be achieved in practice, by considering experience gained through the transition town movement and other related approaches. This talk will feature presentations from the local transition groups and a video presentation from Rob Hopkins, founder of the transition project. 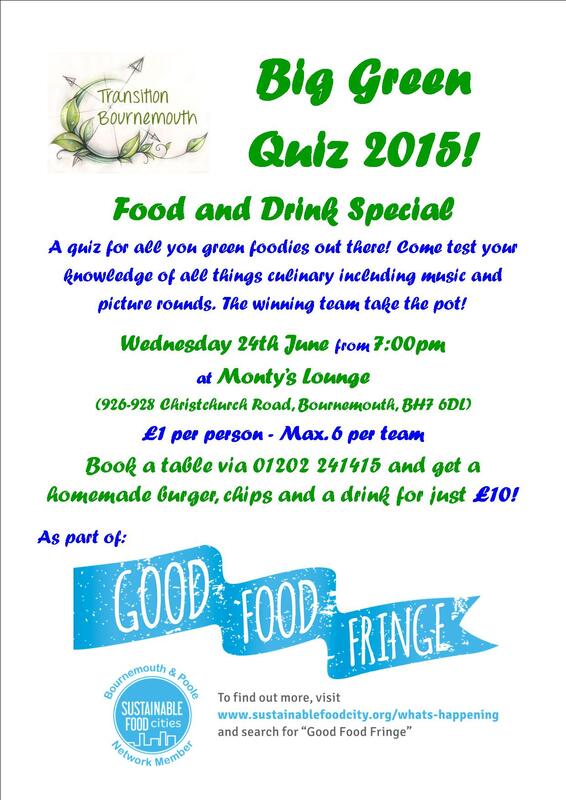 Big Green Quiz 2015 – Food and Drink Special! As part of Bournemouth and Poole Sustainable Food City Partnership’s Good Food Fringe Festival Transition Bournemouth presents: Big Green Quiz 2015 – Food and Drink Special! A quiz for all you green foodies out there! Come test your knowledge of all things culinary including music and picture rounds. It’s £1 per person to enter and teams can have a maximum of six members. The winning team take the pot! Wednesday 24th June from 7:00pm at Monty’s Lounge (926-928 Christchurch Road, Bournemouth, BH7 6DL). Join the Facebook event! SPECIAL OFFER! Book a table via 01202 241415 and get a homemade burger, chips and a drink for just £10! Go to www.sustainablefoodcity.org/whats-happening and search for Good Food Fringe to find more great sustainable food and drink events.